Marcus Clodius Pupienus Maximus Augustus was Roman Emperor with Balbinus for three months in 238, during the Year of the Six Emperors. When the Gordians were proclaimed Emperors in Africa, the Senate appointed a committee of twenty men to co-ordinate operations against Maximinus until the arrival of the Gordians. 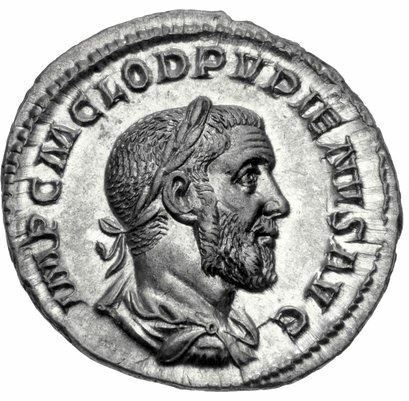 On the news of the Gordians' defeat and deaths, the Senate voted for two members of the committee to be installed as co-emperors – Pupienus and Balbinus. Balbinus and Pupienus didn't work well together, and they were soon living in different parts of the Imperial palace, where they were later assassinated. Both emperors were seized and dragged back to the Praetorian barracks where they were tortured and brutally hacked to death in the bath house.